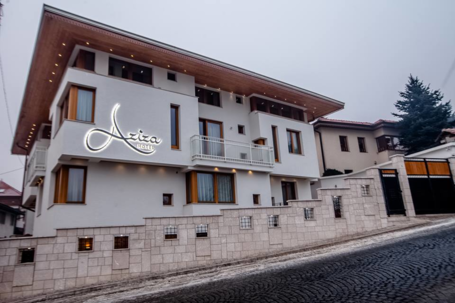 This is the story of the hotel “Aziza”. The story of the lasting love of Mehmed and Aziza, of the family they raised together, of the beloved woman after which the hotel is named. The hotel is located in one of the oldest mahala’s (residential quarters) of Sarajevo. The story begins way back in 1967, when Aziza came to work in a shop near Mehmed’s bakery in Baščaršija. It was a love at first sight. From the first glimpse they caught of each other. After three years of courtship, of hidden smiles and secret winks, their love was sealed by marriage in 1970. In the years that followed their lives were enriched by three daughters, three son in-laws and six grandchildren. All the love they have for each another, for their daughters Amela, Selma and Almedina, and for their fourteen family members is reflected in their hotel. A place where strangers come as guests and leave as friends. The hotel is nestled between Baščaršija’s avlija’s (special old gardens), just like Aziza’s hands between Mehmed’s palms when trying to keep them safe from the winter’s frost. Even when the winter was gone, her hands stayed nestled in his to make a love that lasts forever. When the sun rises in the morning, the hotel lights up like Aziza’s face during their courtship, when Mehmed would give her a secret passing looks and she would pretend not to see him. This hotel, which is a reflection of their love and care, radiates warmth and offers a homely atmosphere when you are away from your own home. You will be welcomed here as a member of the family, when you are away from your loved ones. Everything about the hotel "Aziza" represents what they love and cherish the most - family, warmth, safety and Mehmed’s and Aziza’s union. Especially Aziza - the pillar of the family and her caring nature. The materials the hotel is made of are natural and durable and just like their love, strong and lasting. The windows are large and safe - letting the sun and light in, while keeping the cold and darkness out. So that guests feel cared for, safe and happy. Just as the family does. All 17 hotel rooms are unique, spacious and bright just like Aziza’s soul. So spacious she can fit all her family in it and leave some extra space for friends. When she gathers her loved ones around her, to laugh together, drink coffee and tease each other, while playful grandchildren crawl on the sofa and wrinkle her covers, there is no end to Aziza’s happiness. Just as her family enjoy their time together this should be the way their guests enjoy their time at the hotel that carries her name. It cannot be any other way in Aziza’s home. The thoughtful details in every corner of the Hotel are witness to Aziza’s and Mehmed’s life story. Even the room numbers tell the family story. From one room to the next the entire family history is told, all important years for family Poričanin. It is the story of tradition. The story of Mehmed – a man who has built a life through his own hard work. Who raised a large family with Aziza by his side. Who started as an apprentice to his uncle, in the bakery where he has worked ever since. Who built a hotel and gave it the name of his beloved woman – where the two of them together welcome new guests as dear friends.